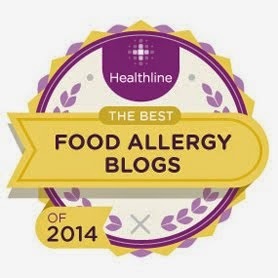 Food Allergy News: New to Peanut and/or Tree Nut Allergy? With several of the big holidays behind us, I've been hearing from many of you who are new to peanut and tree nut allergies, in addtion to other food allergies. For some reason, the new year brings new food allergies and it can be a very scary and confusing time. That's why I'm including a link to a recent post featuring my advice for those new to food allergies. Take heart, take your time to get used to your new life and most of all, join us here as well as on my social networking including my Nut-Free Mom Facebook page and Twitter. I hope you will also check out some great food allergy resources including FAAN, The Food Allergy and Anaphylaxis Network and FAI, The Food Allergy Initiative. As the holidays arrive (Happy Chanukah, everyone!) I know that many parents (especially those dealing with food allergies/nut allergies for the first time) have lots of questions about holiday parties, baking ingredients, school parties, nut-free candy and the overall stress associated with each of these when you take food allergies into account. So now is a great time to share some of my most popular blog posts that talk about dealing with this fun but sometimes stressful time of year. Vanilla extract questions? Click here for baking tips and ingredients info. 6 tips for dealing with food allergies at the holidays from SunButter: they quoted me and shared some of my fave tips for parents. Looking for nut-free candy finds at the supermarket? Here are some that you will see on store shelves. School parties this week? Click this link for an article about food allergies and school parties that I wrote for Chicago Parent magazine. Wow, what a busy week of writing, work and yes, baking! This is one of my biggest baking weeks of the year. Since so many of you are looking for nut-free Christmas dessert ideas, I am sharing three of my favorites that have been popular with blog readers. I focused on nut-free for these recipes, so they will contain dairy and/or other allergens. Some of these take more time than others and for beginning or reluctant bakers, I say you can't go wrong with the Christmas Butter Cookies, aka Super Easy Christmas Cookies. The first one is my all-time favorite Christmas cookie, Snowballs. Usually these are chock-full of pecans or walnuts--not these babies. And they taste great. Enjoy! 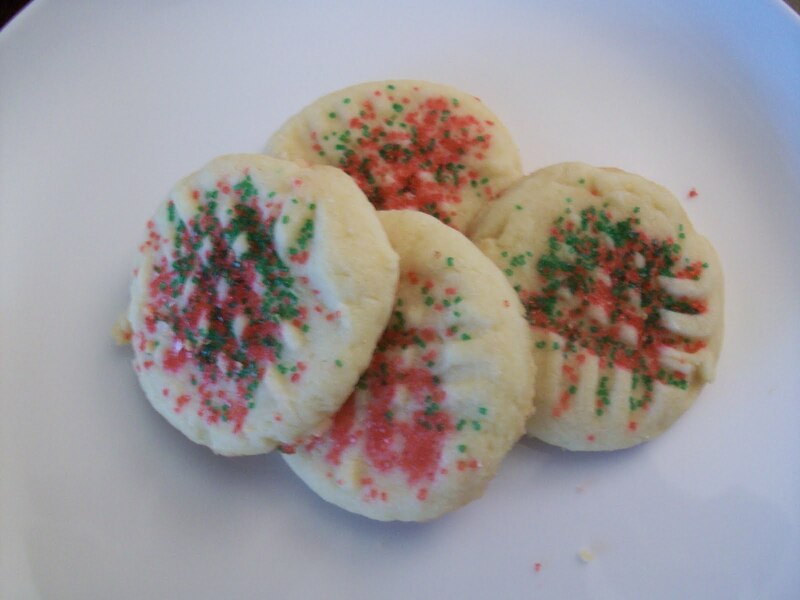 Christmas Butter Cookies--these have that bakery taste but they are SO EASY to make with items you probably already have on hand in your house. Peppermint Cream Mold--totally old-fashioned, really delicious. I modified this from an early 1960s cookbook and it turned out great! 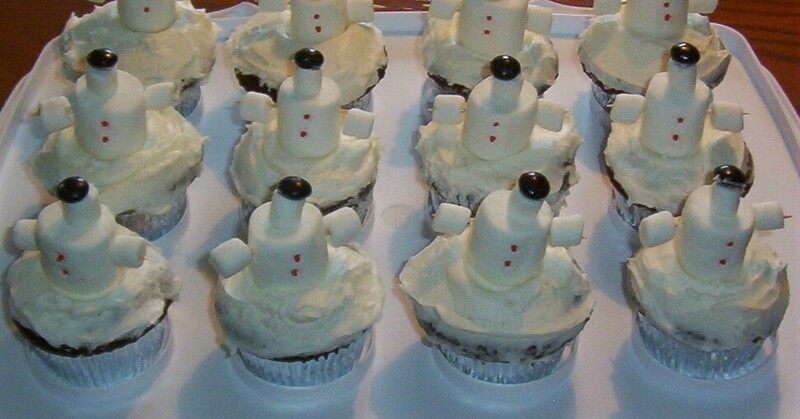 Snowman Chocolate Cupcakes--OK, these take some time to prepare and this is not a quick recipe. For us, it's become a tradition. Get your family, friends or kids to help, and you can have fun while you work on these. And I think you'll really like the result! I submitted this recipe to Chicago Parent's online cookbook. If you decide to make any of these, I hope you enjoy them! Happy Holidays! 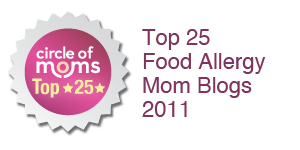 Does my baby have food allergies? My article in Chicago Parent is now online! Just wanted to share a link with you all regarding an article I wrote regarding babies and food allergies. This is not a topic you see much about but so many parents are concerned about what to look for and how to approach a potential food allergy in their babies. We didn't find out about my daughter's allergy until she was a preschooler, (which is scary for different reasons) but I can't imagine how frightening it is to watch an infant go through anaphylaxis. Hopefully my article provides some direction for parents and will encourage people to pursue this with their doctors if they notice anything unusual. If you are in the Chicago area, you can pick up a print version of this in many locations around the city, but for those who aren't, click this link! I was lucky enough to interview the head of pediatric allergy at Children's Memorial Hospital here in Chicago, and I appreciated her insights as well as the family of little Lucy who were interviewed about their experiences. Of course, if you have any questions or medical concerns such as testing, etc., please talk to your pediatrician or allergist. Congrats to Christy W! After a random drawing, you are the winner of the Sweet Alexis cookie giveaway! E-mail me at nut-freemom@sbcglobal.net with your address and also cookie preference--Christmas or holiday. I will forward your info to Sweet Alexis and you're goodies will be on the way! Thanks to all who entered and even if you didn't win, I hope you'll check out Sweet Alexis on your own. They are a great group with truly delicious baked goods. And now on to a topic that many of you have contacted me about and commented on recently: holidays with food allergies. Whether you are celebrating Christmas, Hannukah or any other winter holiday, food is a big part of the tradition and food allergies can present opportunities for family problems and strife. For those of you dealing with a nut allergy diagnosis (or any food allergy diagnosis) this time of year seems destined to make you feel stressed. I wish there were an easy answer to all of the issues that come up when a family first learns that they have a severely food-allergic family member. The good news is that many issues can be worked out--but it might take time. Unfortunately, some people in your circle are going to be very slow to accept and adapt. 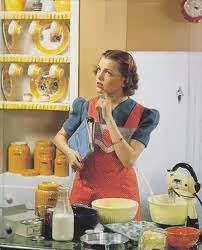 I've heard from several of you who have said family members are sneaking unsafe foods to your child behind your back. Nope, can't happen. That's the kind of scenario that can end up with a visit to the ER--or worse. What can you do? Educate, of course. Try not to lose your cool (easier said than done.) Most of all--trust your instincts. So many parents internalize it when others tell them they are "over the top" or "dramatic" when they are making necessary adjustments for food allergies. They question themselves and their actions and beat themselves up, feeling guilty, etc. Please don't fall into this trap. If you have a child with a severe food allergy, there are certain steps you need to take and there is nothing over the top about it. If you don't take necessary and reasonable precautions prescribed by your doctors and followed up with common sense, then you risk an allergic reaction that has the potential to be fatal. How is it over the top to make your best attempts to prevent this from happening? For any given issue, ask yourself: can this food or activity potentially harm my child? Can I minimize the risks? Can we make this work if I do A, B and C? If not, will it ruin the rest of our lives if I skip this event/avoid this person/sit out this activity for one year? Probably not, right? So feel free to dial down the drama when others try to make food and your child's eating or not eating the end-all and be-all of any holiday event. If you can't do something or your child can't eat something--so be it. Do a different activity and stay upbeat and confident in the knowledge that you're doing the right thing. Don't get me wrong--I am all about participating in family events and as much inclusion as possible for everyone. I don't want allergy sufferers to be forced to stay home or skip things when they have the chance to celebrate with everyone else. What I'm concerned about are the cases where people simply won't respect the food allergy. And by that I mean: getting angry if you bring your own food, offering your child food on the sly ("one bite won't hurt") or turning the tables to make the simple diagnosis of a food allergy all about your parenting skills and how you are wrong to be careful. For those of you having problems getting family members to help you out on this, have you had the straight talk with them you need to have? Have you spelled out allergy risks in no uncertain terms or are you feeling uncertain and insecure because your child has different needs and requirements to stay safe and healthy? If you don't offer clear communication with the relatives, mistakes and accidents are almost inevitable. Not to put all of the blame on us, but we need to drive the bus here. We can't control others or the fact of allergies, but we can control how we communicate about food allergies and how we present ourselves with regard to them. It's not easy, and for those of you who are experiencing difficulties (especially the first-timers) I want to tell you it can and will get easier, but it will take some effort on all sides. You may not believe this now, but you will gain confidence, enjoy new family traditions (with new foods) and enjoy the holiday season. Give yourself time and don't feel badly when it comes to protecting your child from truly risky situations. If not you, who will do this for them? As they get older, they will be the ones advocating for themselves, so you have that to look forward to as well. Here are a few other posts that I have regarding food allergies and holidays. This is a big issue for many people and you are not alone! Hang in there, vent here when you need to and know that many other families need to make food allergy adjustments this year. Organizing school parties around food allergies--my article for Chicago Parent mag. \ Here's a sweet way to combat holiday stress--with a cookie giveaway from Sweet Alexis nut-free, dairy-free and egg-free bakery! 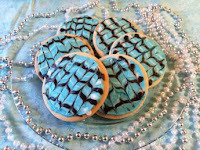 My friends at Sweet Alexis would like to give Nut-Free Mom readers a special chance to win their delicious and beautifully decorated cookies just in time for the holidays. 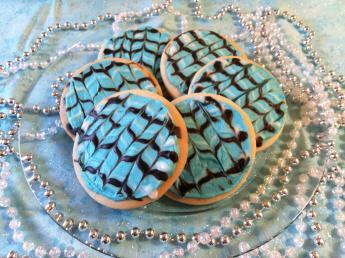 The winner chooses from either red and green Christmas cookies or beautiful blue and white! For your chance to win, simply post a comment on this blog post with your name --first name and last initial is fine. It's hard to deliver a prize to Anonymous. :)I will contact the winner privately for their mailing info. If you like, you can also share your favorite sweet treat that you make for the holidays. After a random drawing, the winner will be announced Wednesday. You can comment today and tomorrow until 11 pm. For those of you who don't know much about Sweet Alexis, they have a storefront in California and a thriving mail-order business. They offer a wide variety of quick breads (like zucchini and banana) and cookies that are free of nuts, dairy and eggs. 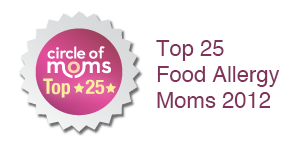 It's great stuff and it arrives fresh and tasty--my kids and I have tried many of their products and we love them all. For product info and a full ingredients list, please click this link. Thanks to Sweet Alexis and good luck everybody! Note: While these cookies are egg-free, peanut-free, tree nut-free and dairy-free and made in a dedicated bakery, they may contain other allergens. Contest participants are responsible for fully vetting the ingredients of these cookies before offering them to an allergic person. 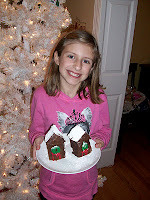 Peanut Allergy News: Nut-Free Christmas Recipe...Mini Gingerbread House Cakes! Kids love to make gingerbread houses at the holidays, but the kits you see in the store all seem to have 7 or 8 food allergy warnings--and always for peanuts and tree nuts. And while supermarket gingerbread kits are pretty to look at, they usually don't taste very good. 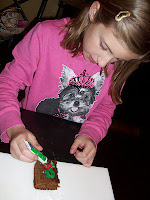 Sure, you can make your own using a gingerbread cookie recipe, but that is a time-consuming project. If you have the time, go for it and have fun. But what if you don't? While looking at a King Arthur Flour baking catalog, I found a solution that I love--mini gingerbread cake houses! (See the pictures above.) My daughter and I had a blast making these and while there are a few steps, this is a pretty easy project. 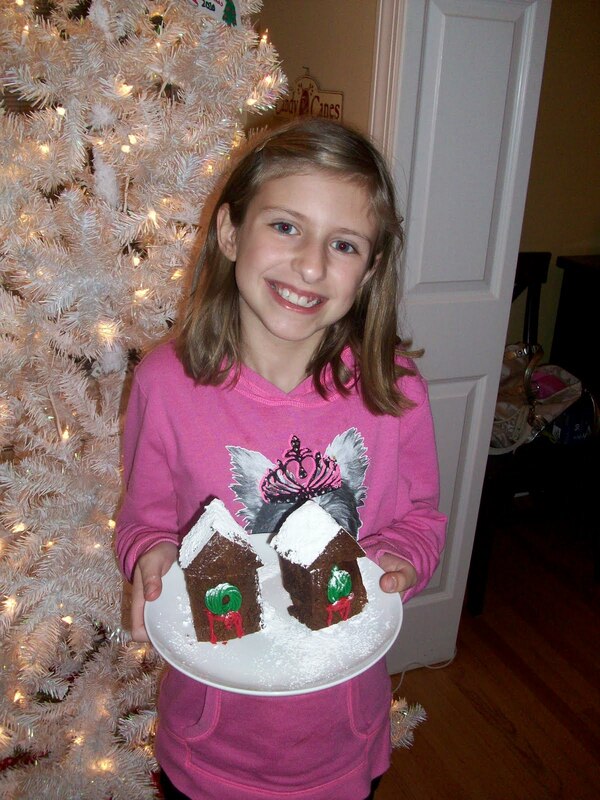 Once your gingerbread is finished, it doesn't take long to create these adorable and delicious gingerbread houses. Regarding decorations for the cakes: You have several options. You can make your own buttercream frosting and use a pastry bag and tip to create the wreath and houses. (Wilton has pastry bag/tips at good prices as well as a buttercream recipe.) You can also use the prepared Betty Crocker cookie frosting--it comes with a built in pastry tip. We used the Wilton cookie writer frosting to create the bow and door--this has egg and wheat allergy warnings for those who need to be careful with those. Sometimes you can find candy wreaths at the supermarket--Cake Mate brand makes these. I haven't seen them yet but it's early days. You should check stores that carry Wilton cake/cookie decorations. They may have some wreaths, too. Wilton is well-marked for allergens -- these candy decorations usually are safe for nut allergies but they contain egg and sometimes wheat. Check the labels to be sure. We ended up making frosting for the wreath and using a star tip on the pastry bag for the wreath; then we used Wilton cookie frosting for the wreath bows and the creation of the door. Powdered sugar sprinkled with a shaker gave a pretty snow effect to the cakes. Yum! 1/2 cup shortening (we used Crisco (non-hydrogenated variety)--you can use your favorite dairy-free shortening if this is a concern). Have a ready a greased and floured 9 inch by 9 inch pan. It has to be this exact size--a smaller pan will create a deflated spot in the middle and the edges will cook too soon. In standing mixer, beat shortening, sugar and egg until well blended. Blend in molasses and water or buttermilk. Gradually add the dry ingredients, and mix until well blended. Pour into prepared pan. Bake for about 45 - 50 minutes. Test at 45 minutes. Cake is done when toothpick inserted in the middle comes out clean. Let cool, remove from pan and then place in freezer, covered, for a couple of hours to make the cake easier to work with. Now you're ready for the houses! You can click on this link at the King Arthur web site to see how to create these or follow directions below. When partially frozen, remove cake from freezer and place it on a cutting board. Using a serrated (bread) knife, trim any tough edges from the cake. Cut the cake into 2 inch cubes, for a total of 16 cubes. Cut 5 cubes on the diagonal to make triangles (these are the roofs of your cake). You will have one cube without a roof--an added treat for you. 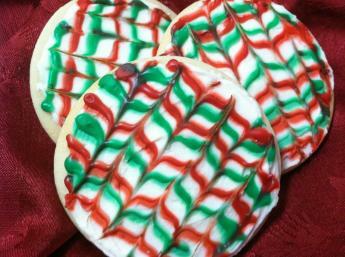 If creating your own wreaths with frosting, draw a circle in green using a pastry bag and the star tip. Then draw a red bow on the wreath with cookie decorator icing (or other homemade icing).Draw a door if desired. If using candy wreaths, secure them to the gingerbread with a dab of frosting. 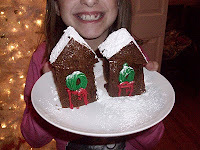 Place roof on top of gingerbread house and press gently to secure the frosting to the house. Sprinkle with confectioner's sugar for snow! Makes 10 houses. The cakes keep, covered, for several days in an airtight container.